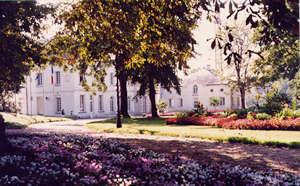 The park of the Perraudiere. December and january : 9 am- 5 pm. November and february : 9 am- 6 pm. March and october : 9 am - 7 pm. 1/05 to 30/09 : 9 am - 8 pm. Puppetplay, Children's playground, Swings, Sandbox, Ping-pong tables, Lawns for sunbathing, Dog admitted if kept on a lead, Exhibition visitation.